Snaps, no. 36: Ernest and Myrtle Clifton Haskins. This magnificent photo depicts Ernest and Myrtle Clifton Haskins on the Viola Street-side porch of their home at 309 Elba Street on a Sunday morning circa 1965. Ernest Haskins (1898-1975) was the son of Damp and Hester Haskins. Myrtle Clifton Haskins (1900-1970) was the daughter of James C. and Susan Clifton Clifton. The Haskins’ 1920 marriage license. Many thanks to their grandson Ernie Haskins for sharing this snapshot. 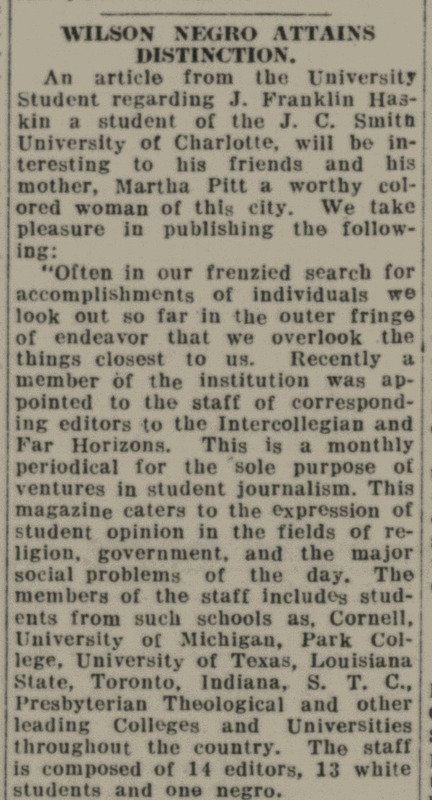 Wilson Daily Times, 22 March 1935. In the 1920 census of Wilson, Wilson County: on Warren Street, Hester Haskins, 56; and children Estella, 18, Annie, 22, Martha, 36, Ernest, 21, Ambroga, 17, Damp, 12, and [grandson] Joseph, 8. On 15 November 1922, George Pitt, 31, of Nash County, son of Wiley Pitt and Ida McNair, married Martha Haskins, 30, of Wilson, daughter of Damp and Hester Haskins. James Haskins applied for the license, and Missionary Baptist minister John A. Mebane performed the ceremony in the presence of Glenn S. McBrayer, Jeff Holloway and Eula Farmer. In the 1930 census of Wilson, Wilson County: at 1200 Wainwright Street, owned and valued at $1700, Damp Haskins, 24, laborer at Coca-Cola plant; wife Sudie B., 21; children Damp Jr., 2, and Hellen, 6 months; widowed mother Hester, 72; brother [nephew] Joseph, 18; Martha Pitt, 52; and nephew Jim R. Haskins, 10. On 18 February 1931, Jos. F. Haskins, 19, son of Jas. Haskins and Martha H. Pitt, married Beatrice O. Bryant, 17, daughter of Isham and Rossie Bryant. Rev. J.T. Douglas performed the ceremony at Calvary Presbyterian Church in the presence of Judge Mitchell and the Bryants. In 1940, Joseph Franklin Haskins registered for the World War II draft in Washington, D.C. Per his registration card, he was born 8 January 1913 in Durham, North Carolina; resided at 1231 W Street, N.W. ; his contact was mother Martha Whitehead Haskins, 1231 W Street, N.W. ; and he worked for Dr. R.M. Williams, 1914 – 11th Street, N.W. On 11 April 1942, Joseph Franklin Haskins married Florence Windom Green in Washington, D.C.
Joseph Franklin Haskins died 16 September 1983 in Charlotte, North Carolina. 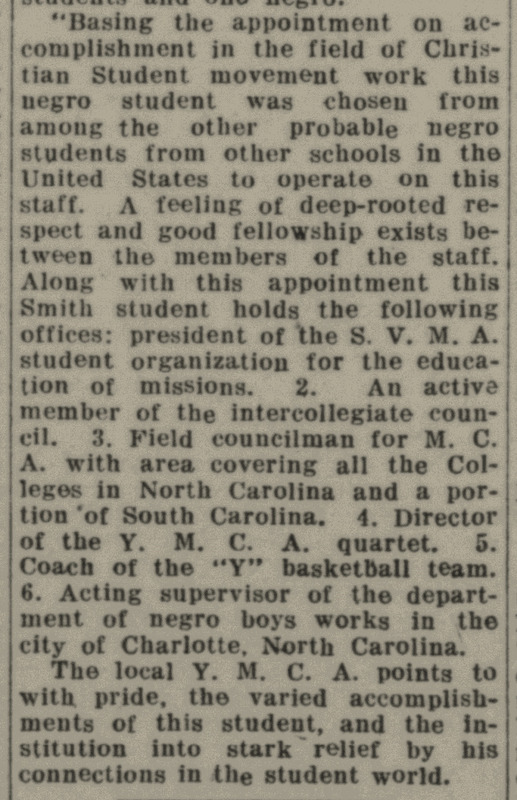 Johnson C. Smith University Bulletin (1935), page 109. Studio shots, no. 46: Beatrice O. Bryant. In the 1920 census of Wilson, Wilson County: at 596 Wainwright Street, tobacco factory laborer Isham Bryant, 27; wife Rossie, 21; and children Beatrice, 5, Bertha, 4, and Inez, 1. In the 1930 census of Wilson, Wilson County: at 805 Roberson Street, Isom Bryant, 37, factory laborer; wife Rossie, 32, public school maid; and daughters Beatrice, 15, Bertha, 14, and Inez, 11. On 18 February 1931, Beatrice O. Bryant, 17, daughter of Isham and Rossie Bryant, married Jos. F. Haskins, 19, son of James Haskins and Martha Pitt, in Wilson. Rev. J.T. Douglas of Calvary Presbyterian Church performed the service at Isham Bryant’s house with Judge Mitchell and the Bryants as witnesses. In the 1940 census of Wilson township, Wilson County: Isham Bryant, 49, machinist at tobacco factory; wife Rossie, 43; daughter Inez, 22, tobacco factory laborer; and granddaughter Bobbie Haskins, 8 [Beatrice B. Haskins’ daughter Barbara]. Beatrice O. Bryant died 12 December 1982 in Jamaica, Queens, New York, and was buried in Rest Haven cemetery, Wilson. 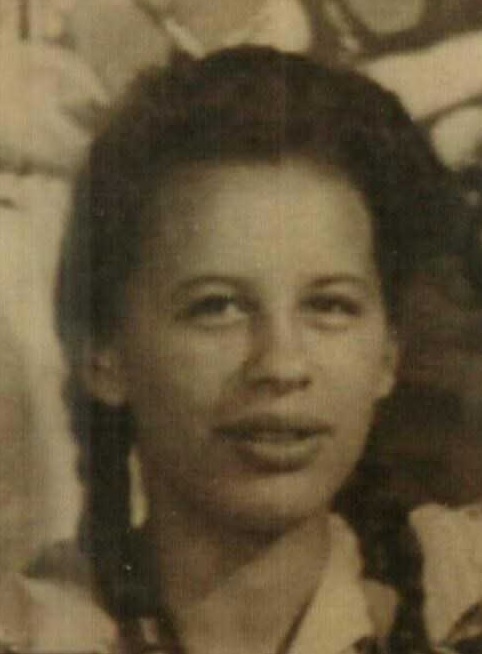 Beatrice Bryant’s daughter Barbara Ann Haskins (1931-2001). Photographs courtesy of Ancestry.com user jkbryant3142. In the 1920 census of New Bern, Craven County, North Carolina: government mail clerk J.L. Cook, 33; wife Clara R., 29; and children Henderson, 9, Edwin, 8, Clara, 4, and Georgia, 2. In the 1930 census of Wilson, Wilson County: on Hadley Street, railroad mail clerk Jerry L. Cook, 43; wife Clara, 39, teacher; children Henderson, 20, Edwin D., 18, Clara G., 14, Georgia E., 12, Annie, 8, Jerry L., 6, and Eunice D., 4; sister Georgia E. Wyche, 48, teacher; and nieces Kathaline Wyche, 7, and Reba Whittington, 19. 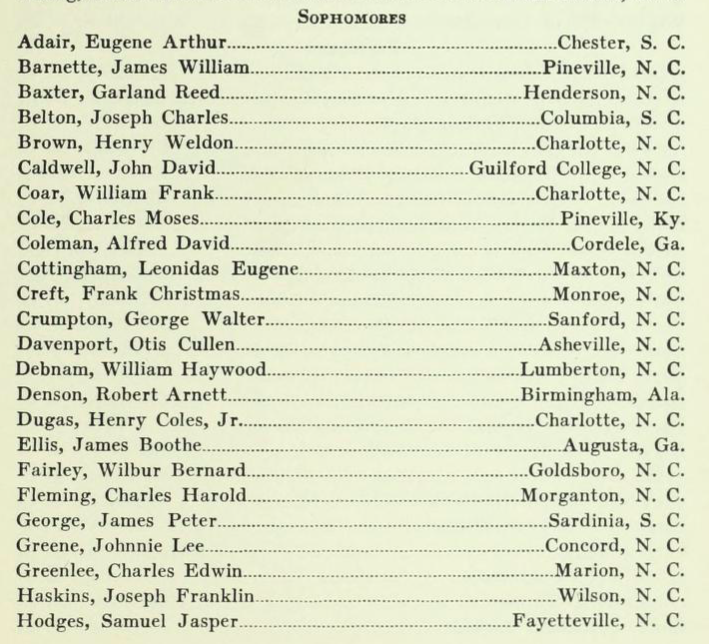 Georgia E. Cooke graduated from Wilson Colored High School in 1935. On 10 June 1940, Georgia Cooke, 22, daughter of Jerry L. Cooke and Clara R. Cooke, of Wilson, married George W. Gant, 24, of Greensboro, North Carolina, son of A.V. and Ada Gant. A.M.E. Zion minister R.A.G. Foster performed the ceremony in the presence of Henderson J. Cooke of Wilson, Joshua W. Levister of Raleigh and A.B. Moseley of Kinston. George and Georgia Cooke Gant’s son George Arlington Lee Gant was born in Wilson in 1941. Georgia Cooke Gant died 16 December 1970 in Greensboro, North Carolina. Per her death certificate, she was born 18 December 1917 to Jerre L. Cooke Sr. and Clara Goddette; resided in Sedalia, North Carolina; was married to George W. Gant; was a school teacher; and was buried at Rest Haven cemetery, Wilson. In the 1920 census of Wilson, Wilson County: Robert Haskins, 37, bottling company laborer; wife Gertrude, 28; and children Mandy, 14; Elizabeth, 12; Estelle, 10; Robert, 7; Lossie, 5; Lawrence, 4; and Thomas, 1. In the 1930 census of Wilson, Wilson County: Robert Haskins, 44, insurance agent; wife Gertrude, 39; and children Mandy, 22, cook; Elizabeth, 20; Estell, 18; Robert, 17; Lossie, 14; Larence, 12; and Tommie, 10. Lossie Haskins graduated from Wilson Colored High School in 1935. In the 1940 census of Wilson, Wilson County: Robert Haskins, 55, drug company salesman; wife Gertrude, 48; and children Mandy, 36; Elizabeth, 33, cook; Estelle, 29, beauty shop cleaner; Robert D. Jr., 29, hotel kitchen worker; Lossie, 24, N.Y.A. stenographer; and Thomas, 20, barbershop shoeblack; plus granddaughter Delores, 15, and lodger Henry Whitehead, 21. For more re Gracie Swinney, see here. The twenty-ninth in a series of posts highlighting buildings in East Wilson Historic District, a national historic district located in Wilson, North Carolina. As originally approved, the district encompasses 858 contributing buildings and two contributing structures in a historically African-American section of Wilson. (A significant number have since been lost.) The district was developed between about 1890 to 1940 and includes notable examples of Queen Anne, Bungalow/American Craftsman, and Shotgun-style architecture. It was listed on the National Register of Historic Places in 1988. In the 1925 Hill’s Wilson, N.C., city directory: Haskins Nathan, lab, h 702 E Green. In the 1930 census of Wilson, Wilson County: cook Addie Haskin, 50; daughters Martha, 20, public school teacher and Addie D., 19; daughter-in-law Gladis, 19; and Nathan, 32, cooper at a tobacco factory. The family rented the house for $30 a month. In the 1940 census of Wilson, Wilson County: at 702 Green Street, Gentle Bynum, 34, truck driver for Farmers Oil Company; wife Rosa, 30; children Mary E., 12, William, 9, and Dorothy M., 2; and sister Gladys Harris, 17. Photograph by Lisa Y. Henderson, July 2017. Black Wide-Awake post No. 1000 — thanks for your support! Borrowing a few goods from a friend. Wilson Advance, 11 June 1896. Neither Davis nor Haskins is found in the 1900 census of Wilson County. Studio shots, no. 27: Myrtie Clifton Haskins. James Clifton, 32, married Susan Clifton, 21, on 26 November 1889 in Franklin County at J.T. Clifton’s. Jackson Hunt and Bet Clifton witnessed. In the 1900 census of Harris township, Franklin County: farmer Jim Clifton, 45; wife Susan, 31; and children Grant, 20, Matilda, 18, Susan, 16, John L., 14, Genievieve, 8, Tommie, 6, Mary, 4, Martha, 2, and Myrtle, 3 months. In the 1910 census of Saratoga township, Wilson County: on Edmunson Road, farmer James T. Clifton, 52; wife Susan, 40; and children Genevieve, 18, Thomas, 16, Mary, 14, Mattie, 12, Myrtle M., 10, Eula P., 8, Minnie B., 6, Wesley, 3, and Leona, 2, plus lodger Arthur Bunn, 21. James reported that he had been married twice. In the 1920 census of Wilson, Wilson County: at 500 Spring Street alley, widower James Clifton, 53, lumber company laborer, and son Thomas, 25, lumber company laborer; daughter-in-law Ethel, 20; daughters Mattie, 22, Myrtle, 20, and Ella, 14, all tobacco factory laborers; and boarders Ella Mitchell, 22, a widowed tobacco factory laborer, and her children Dorothy, 4, Y.C., 2, and James, 3 months. On 20 October 1920, Ernest Haskins, 22, of Wilson, son of Damp and Hester Haskins, married Susan [sic] Clifton, 20, daughter of James and Susan Clifton, in Wilson. Tom Clifton applied for the license, and Rev. C. Barnes, Free Will Baptist minister performed the ceremony in the presence of James Dawson, John Harris and George Farmer. In the 1930 census of Wilson township, Wilson County: on Fence [Finch] Street, wholesale grocery truck driver Earnie Haskins, 31, wife Myrtle, 29, and children Susie, 6, Rudolph, 2, and Peggie, 0. In the 1940 census of Wilson, Wilson County: tobacco factory worker Earnest Haskins, 40; wife Myrtie, 40; and children Susan, 16, Rudolph, 12, Peggie, 10, Alice, 9, Connie, 7, James, 5, Mary, 3, Bobbie, 1, and Robert, no age listed. Mertie Clifton Haskins died 26 June 1970 in Wilson. Per her death certificate, she was born 11 January 1900 to Jim Clifton and an unnamed mother; resided at 521 South Lodge Street; and was married to Ernest Haskins. Photograph courtesy of Ancestry.com user ths1369.